Charlotte Brontë is among the iconic names of English literature and in this wonderful novel Jolien Janzing gives readers a fascinating fictionalised glimpse into the life of the woman behind Jane Eyre. Taking as her inspiration Charlotte and sister Emily’s time in Brussels, where they studied and eventually taught, Janzing weaves an evocative tale of Charlotte’s coming of age and emotional and romantic awakening. At the heart of it is Constantin Heger, Charlotte’s tutor and husband of the school’s headmistress Claire Heger, who Charlotte finds herself falling in love with despite the age gap and his marital status. 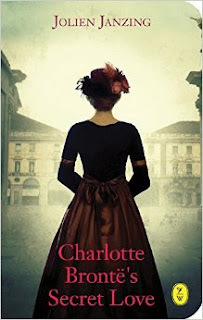 And set against Charlotte’s story, Janzing introduces a compact parallel fictionalised account of Arcadie Claret, the teenage girl from Brussels with whom King Leopold I of Belgium conducted a 20-year affair. Yet it is Charlotte Brontë and Janzing’s characterisation and portrayal of her internal struggle that captivates the reader. Admittedly the romance between her and Constantin remains quite veiled and although Charlotte’s feelings are evident, Constantin’s, while alluded to, are somewhat undefined, yet in a way this merely adds to the bittersweet nature of the whole situation. What Janzing does so beautifully is give a real sense of the experiences, emotions and motivations of Charlotte in Brussels that later feed into her own work. Similarly, Emily, who we are given telling glimpses of, comes across vividly as the woman who would go on to create Wuthering Heights. What we have are really portraits of the authors as young women; we see the personalities, character traits and life experiences that will define their literature, and in the case of Charlotte, some of the pivotal moments and relationships in her life that will shape and develop her very consciousness. The 2015 annual holiday was spent as usual in our beloved holiday spot: Ireland. Of course, being an Ireland fanatic and a Brontë fan, it is no wonder that especially the “ Irish connection” of the Brontë story is an attraction to me. When reading the story about Arthur Bell Nicholls’ life I discovered where he came from and where he spent his life after returning to Ireland. I came across a few other places that needed further investigation. One of them was Kill House near Clifden in the Connemara. This is the house where Arthur’s cousin, Harriette Bell lived with her husband and six of their seven children. Harriette was the cousin Arthur proposed to in 1851 and who declined his proposal. This year, armed with a google map (very vague) and an old picture of the house, we went back to the Sky Road peninsula to have a better look. We were driving very slowly so as to have a good look at all the “big” houses we passed . We took all possible byways and turned corners on very narrow roads. Driving a van on those narrow Irish roads is not an easy thing to do, believe me! Finally, I thought I saw a house in the far distance that looked like a house similar to the one in the picture. We took the byway, which led us to a peninsula off the Sky road peninsula, and arrived in a “village” (which we later found out to be Cill). We recognized the place, we had been there many years ago to try and find a B&B with angling facilities, where some Belgian anglers had been staying. The house that I had seen in the distance was near that B&B, up the hill. Great was my joy when we arrived and it matched exactly the picture that I had in my hand. The sign next to the gate confirmed this. We had found “Kille House”! I was over the moon. The house is now in private hands and cannot be visited. But just standing there at the gate and looking at the house was enough for me! Another personal mission accomplished! Two weeks later we were back in Northern Ireland, Co. Down, to meet up with Margaret Livingston and Finny O’Sullivan from the Northern Irish Branch of the Brontë Society. Last year Margaret and Finny took us on the homeland trail to trace Rev. Patrick Brontë”s roots. Finny mentioned some other places that we might visit this year, off the beaten track again, and certainly not on the homeland tour. So, off we went again, on a Brontë tour with a difference! The first stop was Tully farm in Killead (Co. Antrim), the house where Arthur Bell Nicholls was born. It is a two-storey farmhouse looking out across the fields to Lough Neagh and the Sperrin mountains. The house has changed since the days that Arthur lived here with his parents, William and Margaret Nicholls (née Bell), and his brothers and sisters. Arthur lived here up to the age of 7 when he and his brother Alan moved to Cuba House in Banagher to live with their uncle Dr. Alan Bell and his family. Dr. Alan Bell raised the two boys as his own, offered them a good education and ensured a good start in life for them, which they would not have had if they had stayed in Killead. The next stop on our tour was Killead Church and graveyard on Drennans Road, where we visited the grave of Arthur Bell Nicholls’ parents and some of his siblings. It is said that Arthur and his brother never went back to their birthplace and never saw their parents again, although the families did keep in touch. Margaret Nicholls née Bell was born in the nearby village of Glenavy, and that was where we were heading to next: Glenavy Church and graveyard. The Bell graves are not easy to find, you really must know where to look, but luckily for us, Finny did know. The graves are very overgrown and it is very difficult to decipher the names , but we could discover a few names of the Bell family on the gravestones. We had one more stop to do on this special tour: the protestant old Church of Magherally and its graveyard, a few miles out of Banbridge. It was here that Rev. Patrick Brontë’s parents Hugh Brunty and Alice McClory were secretly married in 1776. The church is a ruin nowadays, but enough is left of it to see how it would have looked like. An additional bonus at the graveyard (not Brontë related) was the fact that the famous Irish poet Helen Waddell (I came across her name and poems when doing research for my next calligraphy project on Irish poetry) was buried in this old graveyard. I knew she was from the area but did not know she was buried in this particular graveyard. I really enjoyed this special tour and learned a lot about the relatives of Arthur Bell Nicholls, facts I had read about in the biographies (see note below), but came alive when visiting the actual area where the family had lived. Finny proved to be a real fountain of knowledge during this tour. Last year I thought we had seen all the Brontë links in Ireland. I wonder, what next year will bring!